“Hello Dragons” (creative…not so much). They smile and say “hello”. Beside me the producers have set up a bed (an impromptu prop). At the head of the bed there’s an easel with a large poster print of my website. The web page is fun, includes my brand messages, and is a good demonstration of the marketing position that I have created. I thought it was important to show this side of the business – after all, it’s maybe 3 months old and I have barely any sales (note to self: don’t say that to Dragons). 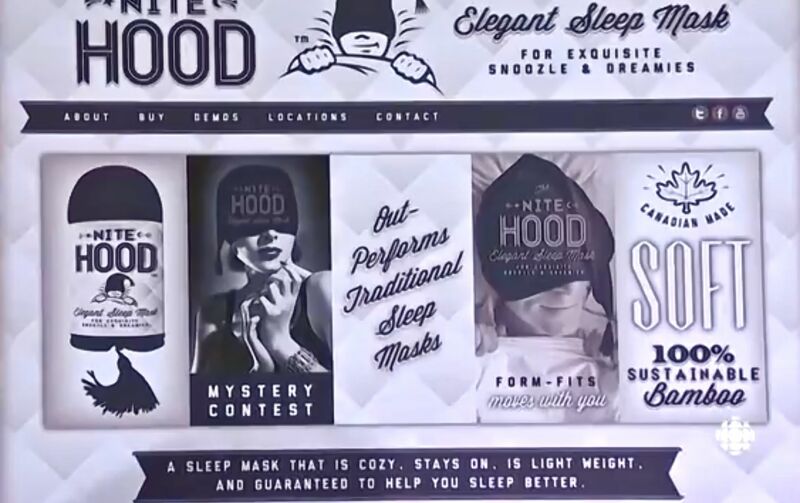 I need to impress them with the concept and the charm of the Nite Hood itself. I elegantly place my pillow with the Nite Hoods on the bed, and do the big poster reveal. I walk back to my spot and am about to launch into pitch mode, when I see a problem – they’re all looking at the image, trying to figure out just what the heck it is. 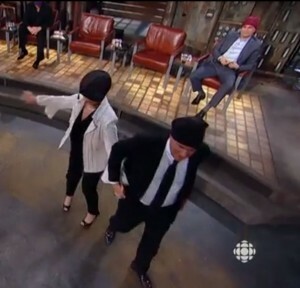 As I mentioned before, there’s a format to Dragons’ Den. The standard protocol for the start of your pitch is your introduction. Name – Product – Ask. Instead of launching right away, I wait for their focus to return to me. Now it’s show time! I think to myself that I have to use this as a mock testimonial. I know the Nite Hood is an odd looking thing and this odd statement from Kevin feels like gold. Unfortunately this interruption throws me off. I forget to state my “ask” – which is $50,000 for 25% of my business. 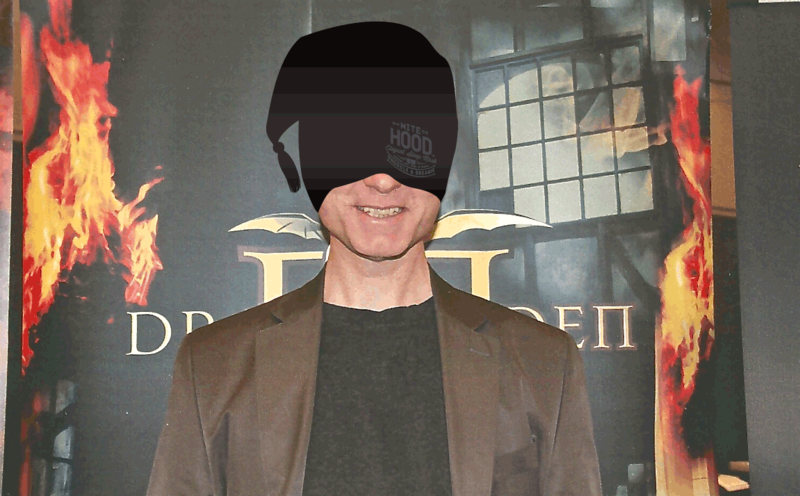 David Chilton tries to help out and asks “how much” I say “$25” – which is the price of the individual Nite Hood. Some smiles from the Dragons. Ooops! “No, how much are you asking for” – (double oops!) I need to get this back on track so I can go into my pitch. I tell them my ask and they all stop to write this down. Wee pause that feels like an hour. I’m about to start and David inquires “Can I try it on?”. Yes, of course!” I trot to the bed and grab my pillow of Nite Hoods. I present one to each of the Dragons. They hold it up like a wet bathing suit – I get back to my mark. Arlene says, “Perhaps you should show us how it works.” This moves me straight to the middle part of my planned pitch where I put on the Nite Hood and walk through all the cozy attributes. They try on their Nite Hoods and are still. Then we get into the Q&A and they come out from under their Nite Hoods. David and Bruce are leading the questions. 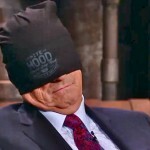 Kevin is being funny and Arlene is laughing at his jokes – she is still wearing the Nite Hood over her eyes. 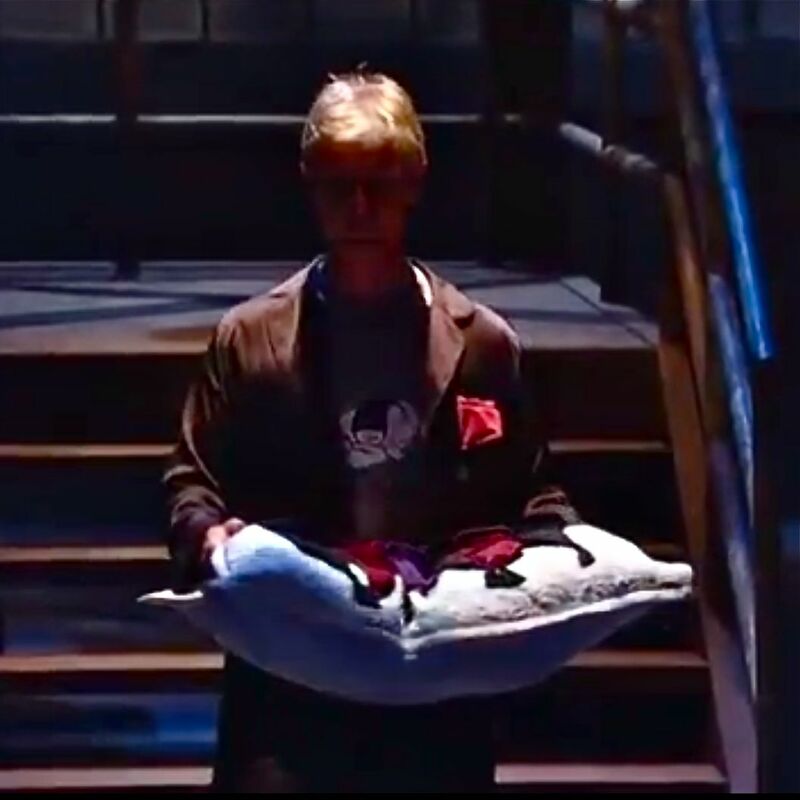 Arlene is prompted by Kevin to get up and moves to the bed while being “sleep masked”. She gropes and giggles her way to the bed. They end up in bed together “spooning”. Bruce is asking about the cost of making my product locally “Designed – Knit – Sewn – In Canada”. All the while Arlene and Kevin are in full improv mode playing up the ON-TV cuddle. I’m wondering how this will look on TV. It’s a pretty confusing Q&A – but charming too. For all the sassiness between them, they are obviously very comfortable with each other. Eventually they reassemble on the stage and Jim hasn’t moved the whole time and is apparently asleep. The days are pretty long for the Dragon’s so I don’t blame him for making the most of it. Arlene eventually wakes him by stealing his stack of money. Kevin, who is always about the bottom line was the first to point out that my ask was too high. My sales aren’t strong enough to justify it. He might have offered me a fifth of my asking price. I calculated my ask on my brand and marketing position and projections based on my test marketing sales, which were really good considering that I came out of nowhere three months earlier. I get a generous thumbs up from Jim (WHO SLEPT THROUGH THE WHOLE SEGMENT!) 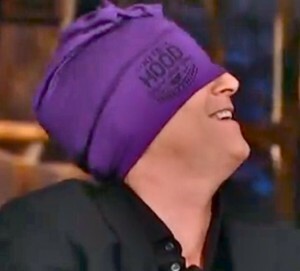 and Bruce for the viability of the Nite Hood.. and a polite no as well. Arlene says that no woman would be caught dead in it and she would be out (60% of my sales are women!). David says that it was in conflict with his toupee (I think he was kidding) and he would be out as well. I say goodbye to the Dragons and exit the stage set to a corridor where I’m greeted by Charlie and a cameraman. We do a little post show interview and I’m pretty happy with it all. I didn’t get the deal. But the Nite Hood, despite being the center of fun, prevailed (because it’s a fun approachable brand, and this reinforced it). I meet the line producer and she congratulates me on a great segment. It was pure chaos but everyone seems pretty happy with it. Now back to the staging area where the rest of my stuff is sitting. A whole set of Nite Hoods in an attractive retail display that I didn’t get to show in my pitch. A cameraman comes up and says “that story about you wearing a t-shirt on your head is what I do too”. He totally gets the Nite Hood and quickly I sell him one. Suddenly, CBC staff are my biggest buyers – within 10 minutes they’re gone. It all feels auspicious. It’s now 3:30 and I’ve been here since 8:30. The day feels like it has lasted a week, but I’m full of energy. A young guy in a suit comes to buy one. He is Kevin’s right hand man. I know he is probably a pretty slick business guy, but he is very friendly and seems genuinely interested in my invention. We chat for a long time and I sell him my demo Nite Hood that’s in my breast pocket. He assures me that Kevin is actually a really nice guy (I agree). He hands me his card and wishes me luck. 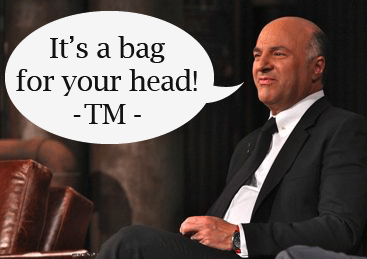 Later I ask him in an email if I can quote Kevin’s line: “It’s a bag for your head!” but I never hear back – I guess that means yes! So no, I didn’t get the money. But I’m not upset at all. In fact I slept like a baby that night. Despite the lack of funding, I had the impression that the product showed well. The sales back stage felt great. And I’ve seen a massive jump in online sales since then. 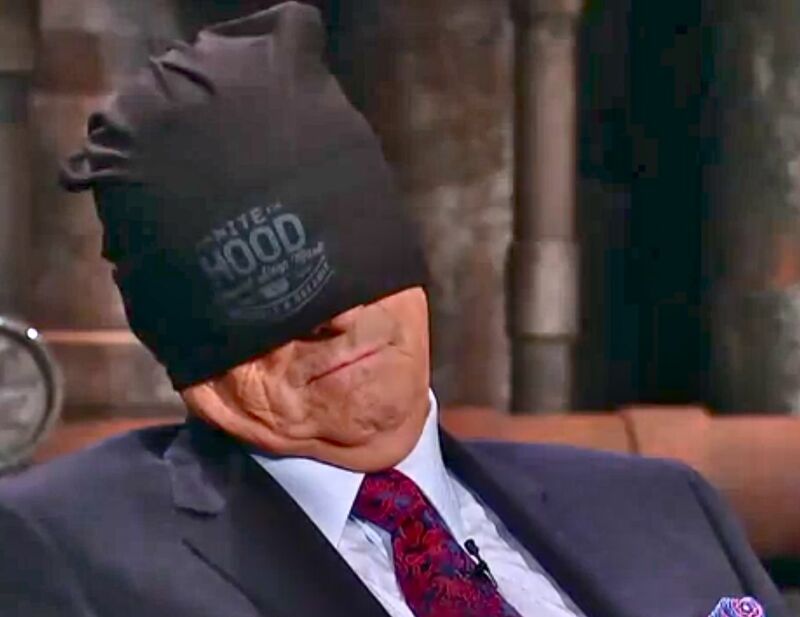 While the Dragons might not have invested, it seems like simply being on the show, and letting the Nite Hood stand apart from the typical sleep mask had one heck of an effect. So again, thank you Dragons. You’ve helped my business, and my very cozy product (in many more ways than just publicity). 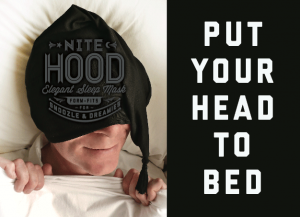 I’m going to work to get Nite Hood into more retailers soon, and work on some advertising to spread the word. If you could help, I’d appreciate it. 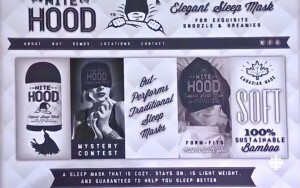 Please “Like” Nite Hood on Facebook (and a “share” would also be exquisite) and check us out on Twitter. Finally, thanks for reading this series. It was an incredible experience, and I think, a great result. 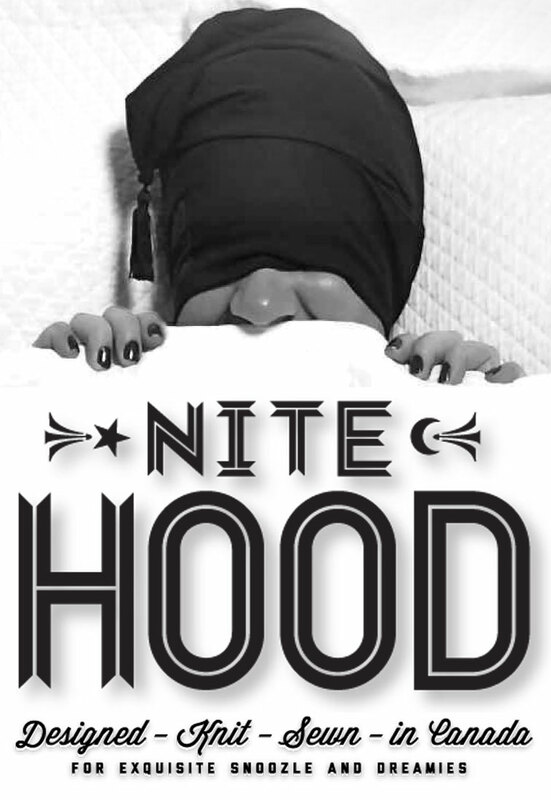 And now it’s time to pull on my original Nite Hood and get a little more much deserved sleep. I may actually dream about Kevin this time… the whole “snuggling with Arlene thing” was really very funny.